YLI Soft Touch Thread was initially introduced as a bobbin thread but it has rapidly gained popularity as a great piecing and applique thread. 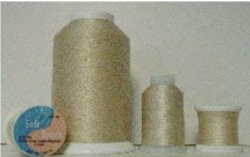 YLI Soft Touch Thread can also be used for lace making, binding quilts, and fine embroidery. 60 weight 2 ply Extra Long Staple Egyptian Cotton.